Authorities have arrested one person in connection with the wave of suspicious packages sent this week to political critics of President Trump, the Justice Department said on Friday. FBI special agents arrested Cesar Altieri Sayoc, 56, in South Florida, a law enforcement official confirmed to NPR. 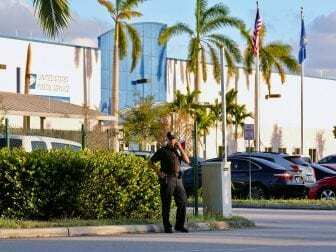 Sayoc has a criminal record and public records connected him with an address in Davie, Fla.
Police outside the U.S. Post Office Royal Palm Processing & Distribution Center, in Opa-locka, Fla. on Thursday. On Friday morning in a parking lot in Plantation, Fla., FBI and other investigators surrounded a white van believed to be connected to the case; their inspection was shown live on cable TV and the van was loaded onto a flatbed truck. A news conference was scheduled for 2:30 p.m. Friday at the Justice Department in Washington, D.C.
One was discovered in Sacramento, Calif., addressed to Sen. Kamala Harris, said a spokesman for the sheriff’s office there. One was discovered in Florida addressed to Sen. Cory Booker, D-N.J., and one in New York City to former intelligence boss James Clapper.